To meet the require­ments of Air Ministry Specification F.20/27, Sydney Camm of Hawker designed a single seat fighter biplane, which flew for the first time in August 1928 powered by a 450‑hp Bristol Jupiter VII radial engine. It was also tested with a 520‑hp Bristol Mercury VI powerplant, also a radial, and the satisfactory results inspired the design of the Hornet prototype. It was clear to Sydney Camm at Hawkers that the F.20/27 specification would soon have to be revised, and so in 1929 Hawkers began work on the Hornet. which utilized the 420‑hp (313 kW) Rolls Royce F.XIA V‑type engine enclosed by a smooth, streamlined cowling. The new fighter prototype was a single engined biplane, with single bay wings, known as the Hawker Hornet, first flew at Brooklands, Surrey, in March 1929. It used Hawker's tubular steel construction method and all metal structure. The Hornet made its public debut at the 1929 Olympia Aero Show. The engine was changed for a 480‑hp (358 kW) F.XIS when it was sent for service trials. Registered J9682, the Hornet was purchased by the Air Ministry in September 1929 and renamed Fury I, and delivered to Martlesham Heath for service trials. It was evaluated against the similarly powered Fairey Firefly II, being preferred because of its better handling compared with the mainly wooden construction of the Firefly. The private-venture prototype (G-ABSE) made its first flight on April 13, 1932, and was developed as the Intermediate Fury. From this was evolved the High Speed Fury, also a private venture, flown for the first time on May 3, 1933, and subsequently fitted with various Rolls-Royce Kestrel or Goshawk engines. 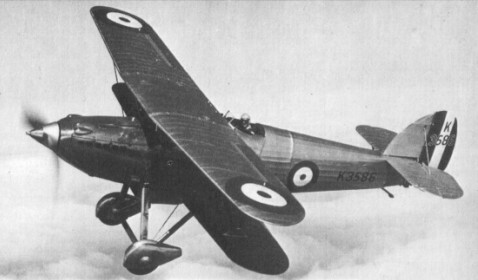 British Aerospace records suggest that this biplane was re-engined in 1934 with a Goshawk III and flown on 17 October of that year, with which it attained a speed of 394km/h, subsequently receiving a later 518kW Goshawk engine. After evaluation, Specification 6/35 was issued to cover the production of 23 similar aircraft ordered initially in August 1930, with 640-hp Kestrel VI engines, as Fury IIs for the RAF. Officially, the Fury was constructed under Specification 13/30, though it would be more accurate to say that the specification was written round the Fury. 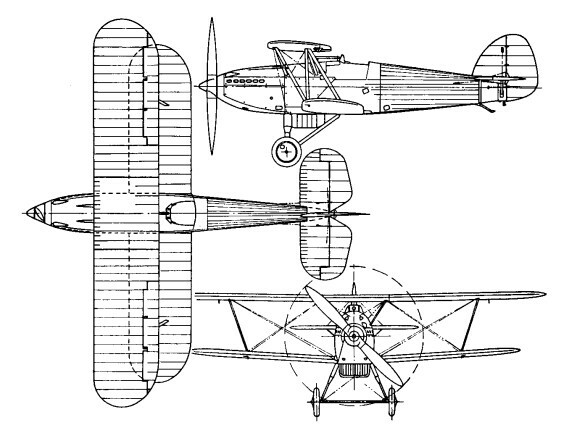 The fighter had a standard tubular metal airframe of rectangular section, fairing into an oval; the forward fuselage was metal-skinned and the rear portion fabric-covered. The staggered, unequal span wings had ailerons on the upper mainplane only, and the wooden two-blade propeller was driven by a supercharged 525-hp Rolls-Royce Kestrel IIS engine, the developed version of the F.Xl. Standard armament comprised two synchronized Vickers 0.303-in (7.7-mm) machine-guns in the nose and racks for light bombs could be fitted beneath the lower wings. The first production Fury I flew on March 25, 1931. No 43 Squadron received 16 aircraft in May 1931, and Nos 1 and 25 Squadrons were equipped from orders placed during that year. The Fury had an exceptionally rapid rate of climb, 3048 m (10 000 ft) in 41 minutes, was highly manoeuvrable, and was the first intercepter with the RAF capable of achieving a level speed of more than 322 kph (200 mph). General Aircraft was given an order for 75 of this version, but this was not completely fulfilled though it included a few Fury IIs for South Africa. In 1934 it was decided that a Fury I should be fitted with a Kestrel VI with composite cooling, modified fuel and oil systems and streamlined wheel spats as the Fury II. This was first flown on 20 August 1935. 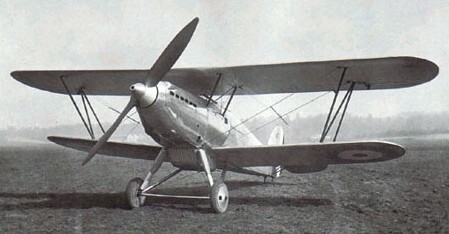 Twenty-three production Fury IIs were built by Hawker with increased fuel capacity, followed by 89 from General Aircraft, six of which were delivered to the South African Air Force. Fury IIs entered RAF service (with No 25 Squadron) in early 1937, but the five squadrons equipped with the Mk II had begun phasing them out by January 1939. However, 16 Fury Is and.48 Fury IIs were still serving, with RAF training units, at the beginning of the Second World War. Altogether 118 were completed for the RAF with 391kW Kestrel IIS engines. Hawker Fury number 401 was exported to Norway for evaluation. It was powered by the Armstrong-Siddeley Panther IIIA radial engine, and made its first flight on September 9 of the same year. 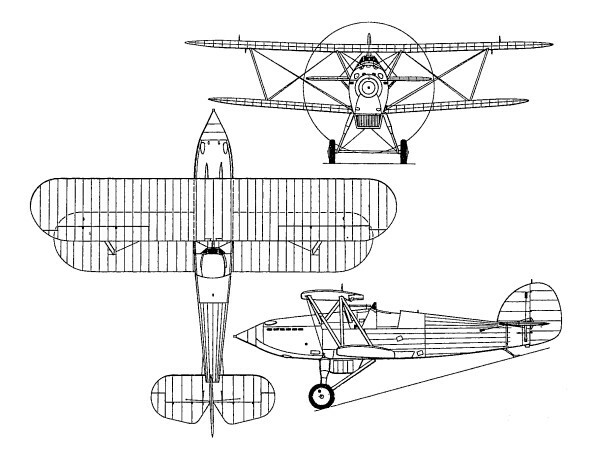 The aircraft was tested briefly at Brooklands and Martiesham and then flown to Oslo by P. W. S. Bulman. It was later tested with a ski undercarriage, but plans to produce the type in Norway did not materialise due to c.g. problems. Six Pratt & Whitney Hornet-powered Furies went to Persia, three Furies to Portugal, and six Hispano-Suiza 12-engined aircraft to Yugoslavia. These foreign models were armed with various calibre machine-guns of Colt, Mauser or Spandau manufacture, and those supplied to Yugoslavia could carry two additional machine-guns beneath the lower wings. Engine: One 525 hp Rolls-Royce Kestrel IIS. Maximum speed: 333 km/h (207 mph). Ceiling 28,000 ft. (8,500 m.) fully loaded. Armament: Two synchronised machine- guns.